“Pyar ho gaya hai mujhe usse, jise mein kabhi mila hi nahin”: the trigger line of Salman Khan Films new movie Notebook starring Zaheer Iqbal and Pranutan Bahl. Even though this is only 15 seconds into an enthralling trailer, there can be no doubt that this is a very strange love story indeed. Kabir and Firdaus will find themselves in a written love story which seems to start and end in a notebook. 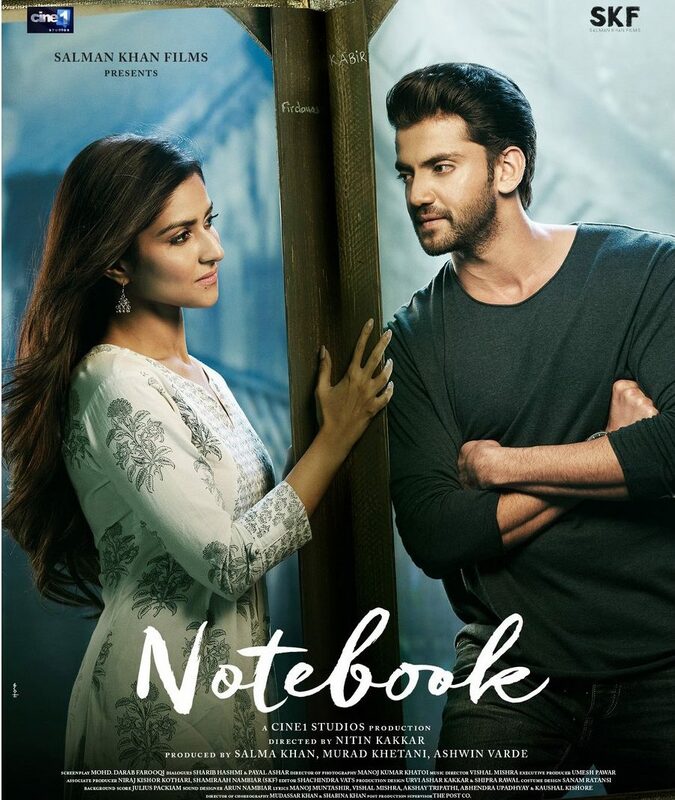 Yet in the very words of this notebook there is the essence of love, “Mujhe tumse pyar karne ke liye koi waja ki zaroorat hi nahin”. Vishal Mishra is tasked with giving music to these words, which is both a simple thing and an impossible one. Its simple because Bollywood has been putting these sorts of words to song since inception, but the difficulty comes in that the story must be told from 2 sides, possibly never to meet; something that Bollywood has not done before. “Mein safar mein hoon, khoya nahin” is how the lyricist chooses to theme the opening song Safar. Mohit Chauhan is tasked as its singer with a traditional Kashmiri mix of acoustic guitar and rabab. While the lyrics continue along this theme mixing in Kashmiri as it goes, the insturments shift to drum kit and lute in a sort of mixed rhythm rather than beat, allowing the rabab to return for the final bridge. To do all this though, this song is by far the longest in this album at nearly 6 minutes and its stop-start nature makes this a little more agonising then would be hoped for. Nevertheless, when you can stretch Mohit Chauhan, something has certainly been achieved. The story of Notebook is packed around a remote school for 7 remotely based children. Thus, there must be a song for the kids, by the kids. In Bollywood, there isn’t much more Kashmiri then the 2003 hit song Bumbro. Kamaal Khan sings for Zaheer Iqbal as he dances with the kids in this remake of the now classic hit. However, its important to realise that Vishal Mishra has cleverly kept the motif of Bumbro but found his own way in the song, mixing in Kashmiri language and a big drum which mean that this song manages to find a new path from an old root song. Of course, being a love story there must be an iconic love song but how do you do that without having the characters meet? That is the premise of Nai Lagda, a sad, heartbroken tale of love that can not be requited. Vishal Mishra takes on this song himself, letting rip raw emotion with the odd combination of electric guitar and tabla. While this is not a very long song, it certainly feels like one as the searing pain of love that cannot be hits home with the audience. Asees Kaur uses a bridge done in violin to bring the girl’s side to the forefront but in the end this is all for Kabir. Dhvani Bhanushali is known for pop hits especially ‘Leja Re’ so when her name appears on album its easy to fall into anticipation of more of the same. In Laila, Vishal Mishra gives her soft, smooth violins backed by a big drum for beat and then lets her step up to the mic and make this song all her own. This is very much from the girl’s side and is both sad and hopeful. Not teary in any way; after all, Firdaus is torn between the known and the unknown, having both a wedding and words in a mysterious notebook. The musicality doesn’t give away anything and is consistent throughout, leaving Dhvani to tell the story as she sees fit. The Notebook Symphony is a final instrumental touch to this album. Combining together the themes of the above songs, it could be the perfect title song, acting both as teaser for music to come and a silent backdrop to the epic beauty of Kashmir and the lake setting of this film. The merging, however, is not consistent and the voice is mixed up so while the themes are there, they have to be searched for which is distracting for cinemagoers, watching on in awe at the beauty of a landscape. This is the end of the official album… but wait there’s more! As a promotional add-on, Salman Khan takes to the mic himself in a short, sweet song called Main Taare. In what could be a perfect Lonely-Hearts video, Salman tells watchers and listeners that his arms don’t reach far enough to pull the stars from the heavens, because “Mujhme alag baat nahin, Dil phir bhi chupke se yeh kehe raha tumse, tum mujse pyaar karogi kya”. In doing so, with the odd wink and flash of biceps he makes everyone’s hearts skip a beat, reminding all what makes Salman. While this is a unique love story for Bollywood, it is inspired by a Hollywood classic The Lake House starring Keanu Reeves and Sandra Bullock. While elements of the story very much hold to its Hollywood equivalent, the music is ultimately what separates Notebook. This places a great burden on the shoulders of Vishal Mishra. So, he has given in this album a confusing title song, the female perspective as told by Dhvani Bhanusali rather than the music, sung a broken love song himself, used Mohit Chauhan to light up Kashmir and shown Bollywood legacy. The fact that Bumbro is likely to be the most popular amongst these shows that even though music is Bollywood’s great separator from Hollywood, we can still find ways to mess it up. 16 queries in 0.382 seconds.